Nestled among the more modest vacation bungalows along Lake Hoptacong are the remaining grand summer cottages of millionaires and captains of industry. Among them is Attol Tryst, the 18-room Queen Anne/Swiss chalet style lakefront estate of one of the 19th century's most popular American entertainers, Lotta Crabtree. Born Charlotte Mignon Crabtree in New York in 1847, Lotta took a somewhat serendipitous path toward stardom, influenced, in part, by her parents' separate ambitions. Her English immigrant father John left for California in 1851, hoping to strike it rich in the gold rush. Lotta and her mother Mary Ann arrived a year later, as planned, only to find that John was not waiting for them in the appointed place. Deciding to make the best of the situation, mother and child soon befriended a group of entertainers, which led to Lotta enrolling in dance lessons. John caught up with his family in 1853, having not struck gold but flush with another means of making a living. He'd realized that possibly the next best thing to mining a claim was to rent lodging to those who were still trying to. Mother and daughter joined him at a rooming house in Grass Valley, California where he set up business. Coincidentally, one of their neighbors was the famous actress and courtesan Lola Montez, who saw the talent within young Lotta and allowed the young girl to dress up in her costumes. Though Montez clearly loved Lotta and apparently saw her as a protege, the Crabtrees left Grass Valley for another boarding house 40 miles away. Some contend that the actress wanted to take the child on the road with her, and moving away was the best way to discourage her. Regardless of the reason for the move, Montez's admiration of Lotta must have made a big impression on Mary Ann, because the youngster was soon enrolled in more dancing and singing lessons. Lotta made her professional debut at a local tavern, then took the show to mining camps in the area. Not long after, the Crabtrees moved to San Francisco, where Lotta performed between tours of Sacramento and the San Joaquin Valley. By the age of 12, she was a highly-in-demand performer in the city, and her mother/manager saw a sterling opportunity. Mary Ann booked Lotta on an extensive tour, with performances in Chicago, Boston, New York and several other locations along the way. 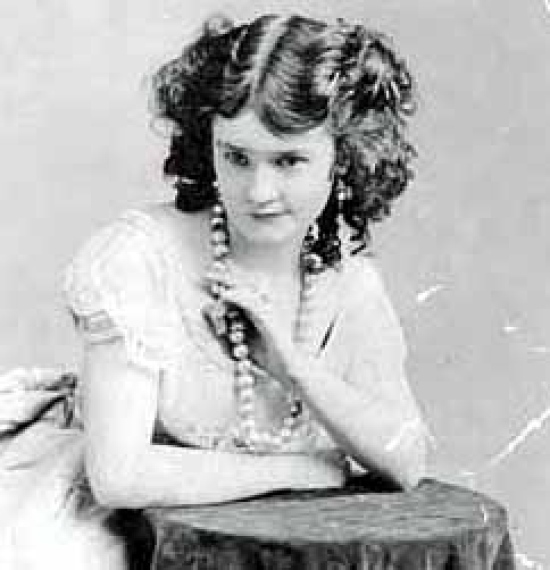 By the time she was 17, Lotta was taking on stage roles in plays including Uncle Tom's Cabin and Little Nell. Mary Ann made sure that Lotta's talents were well rewarded. In the days when they were touring mining camps, she insisted on being paid in gold, and Lotta often kept watches the miners tossed on stage in admiration. When the gold got too heavy to travel with, the pair began investing in real estate, bonds and race horses. There seems to be a fair amount of conjecture on Lotta's love life. Surely, her busy touring and performance schedule left her little time to develop long-term relationships, but she's said to have had several affairs. Lotta spent more than 20 summers as the lake's most famous resident, sailing, painting and entertaining friends. Some say that the eccentric, decidedly single entertainer found it dull, living amid her wealthy and married neighbors, but her mother enjoyed hobnobbing with millionaires. After suffering an accident in 1891, Lotta retired from the stage and subsequently left New York to spend her winters in Boston. From what I've been able to determine, she continued to summer at the lake until her mother's death in 1905. 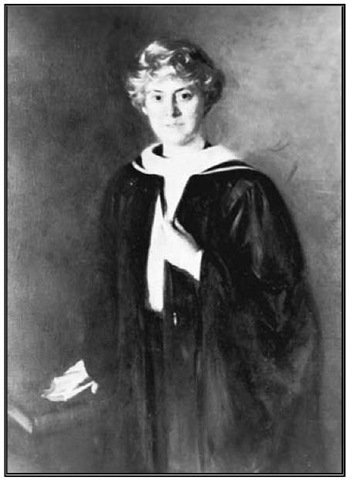 She sold Attol Tryst in 1909 and died in 1922, arguably the wealthiest woman in entertainment. While Lotta Crabtree is no longer a household name, the entertainer continues to make an impact through her considerable wealth. Her estate, valued in the neighborhood of $5 million, was allotted to several trusts to fund, among others, care for injured World War I veterans and their families, hospital care for the poor, animal welfare, and theatrical performers in need. Interestingly, she also established a fund to provide loans to graduates of the University of Massachusetts who planned to enter the agriculture field. While UMass historians haven't been able to find any link between the actress and the school, there's a rumor she might have been romantically involved with a faculty member. In any case, her generosity lives on through the fund and a womens' dormitory named in her honor in 1953. I love a good border dispute, and New Jersey has had its share. The most recent reached the U.S. Supreme Court, when New Jersey won bragging rights to a portion of Ellis Island in 1998. A hundred and thirty years earlier, the state of New York basically appropriated a tract of oyster bed on our side of Raritan Bay and gave it to the federal government for the construction of Great Beds Lighthouse. Then there's Rockleigh, the tiny Bergen County village. It's so close to the border that some might think it's actually in New York, and for a time many years ago, it was. Where the Ellis Island and Great Beds issues might be perceived by Jerseyphiles as yet another example of our larger neighbor throwing its weight around, the Rockleigh story is based in bad mapping. We're talking about the 1600s here, an age where surveying equipment left a lot to be desired. When the Duke of York issued the charter for New Jersey in 1664, he was working with bad information. He declared the boundary with New York to start at latitude 41 degrees, 40 feet to the west and conclude where a southern branch of the Delaware River fed into the Hudson River. You can see the problem: nowhere do the two rivers meet. Though settlers faced a degree of uncertainty when they applied for land patents, they came, nonetheless. London physician George Lockhart seems to have taken the safe route in his approach to owning land in the area. Having received a patent of 3800 acres from the East Jersey Proprietors in 1685, he sought further confirmation of his ownership from the Province of New York when that government claimed the tract within its jurisdiction. The guy really covered his bases, even though he never settled the land, himself. It wasn't until 1769 that the current boundary line was settled by royal commission, frustrating both colonies. New York had wanted the land as far south as Closter, and New Jersey had claimed additional land up to Haverstraw in Rockland County. Either way, Rockleigh's status was settled: it was in New Jersey to stay, first as part of now-dissolved Harrington Township and eventually as part of Northvale. 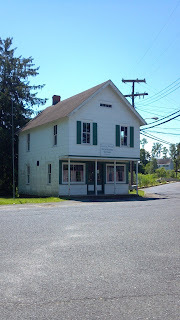 As was once the fashion among certain communities in the state, residents seceded in 1923 over a dispute with the larger township (this one over water lines) and formed their own borough. The community proudly preserves its historical district, which includes several 18th and 19th century homes, many of Dutch architecture. In all, Rockleigh's population is just over 500, living in fewer than 70 homes, each standing on at least two acres of land. It seems that the town has remained true to the description it provided to the National Register of Historic Places: "represent[ing] a way of life which appears to have disappeared from the New Jersey culture: an area settled by a small number of families, enlarged by family intermarriages and an occasional local settlers and stabilized by the mid-19th century." You know you're heading for a really hidden New Jersey gem when you have to stop at a guard shack to get in. I found myself doing just that the other day as I approached the entrance to the New Jersey National Guard Training Center in Sea Girt. My mission? To check out the National Guard Militia Museum of New Jersey. Assistant Curator Joe Bilby had graciously agreed to give me a tour of the museum and its impressive collection of military artifacts. Truth be told, this was a visit I'd been anticipating for a long time, but Mother Nature had other plans. Hurricane Sandy's storm surges flooded the museum with over five feet of ocean water, affecting about 85 percent of the collection and decimating the public displays. Through the persistence of staff, volunteers and visiting specialists, the museum was ready for an official reopening in April, even as restoration and preservation work continues. what they wore in New Jersey. As you walk in the door, you're addressed by a sight you'll see in no other museum in the state: an authentic Civil War cannon mounted on a sturdy carriage. Along the surrounding walls are displays that explain New Jersey's military history in chronological order, using historically-accurate uniforms and weaponry (some reproduction, some authentic). Circle the room slowly, and you'll get a new understanding of the contributions our predecessors and present-day neighbors have made to preserve our shared freedoms. You'll also get a perspective on the colonization and growth of the state that you're not likely to get at any other museum. The exhibits cover all the big wars you learned about in high school, as well as many you might not remember as well. Whether you're a history buff or just a casual visitor, you're bound to make a few new discoveries. Want to know about what our forebears did during the Whiskey Rebellion, the War of 1812 or the Mexican War? You'll find out at the museum. I was especially impressed that the timeline starts with a discussion of the original New Jerseyans, the Lenape. Did you know that the first non-native battle casualty on soil within present-day state borders was one of Henry Hudson's Half Moon crew? To my knowledge, there isn't another museum in the state that brings that fact to light. One of the things I really liked about the displays overall was that they include the diversity of the people who have represented New Jersey in our nation's conflicts, and the commitment of our citizen soldiers. The voices of our present-day soldiers are represented in post-September 11, 2001 timeline, complete with video footage and recollections from those who've served in Iraq and Afghanistan. Considerable space is also given to the story of the first African-American battalion, which was organized in 1930 as a militia in order to circumvent the federal military segregation orders that were then in force. Ultimately, New Jersey became the first state to fully integrate its National Guard. The artifacts currently on display at the National Guard Militia Museum represent only a small portion of the overall collection. Other exhibits await the further preservation of artifacts affected by the flood. As we walked toward the museum's Civil War-era submarine, the Intelligent Whale, Joe ushered me past several tables were covered with artifacts in various stages of restoration, ranging from a portable organ to uniform boots and canteens. Another room is dedicated to several racks of vintage uniforms in the process of being reconditioned, while a documents area is stacked with archival boxes full of maps, letters and other ephemera. In fact, the museum holds the nation's largest collection of New Jersey-related Civil War research material. Joe noted that as staff members and volunteers were piecing through the the collection to assess storm damage, they'd come across interesting items they'd forgotten they'd even had. For a military historian, it had to be a dream come true. Besides the physical artifacts and documents, the museum is amassing an impressive collection of oral histories from surviving veterans. The full interviews are available for researchers, but excerpts are also available to the public online. While the museum is making progress on getting back to its pre-storm status, there's a lot of work to be done. Its non-profit foundation continues to accept monetary donations to fund improvements and ongoing programs. The National Guard Militia Museum of New Jersey is open every day from 10 a.m. to 3 p.m., except for state holidays. Whether you're a military buff, a New Jersey history enthusiast or simply looking for an interesting field trip on a rainy day at the shore, it's well worth your time to check it out! I hate cicadas. There. I said it. As a nature lover, I know I should appreciate them. I know I should marvel at the recent brood, which has emerged from the ground after a 17 year wait. And I know I should probably be thrilled by the otherworldly spaceship-kinda sound that indicates their presence in a stand of trees. I know all that, but I just don't like 'em. There you go. When several of my naturalist Facebook friends started posting their cicada sightings and observations, I asked the question, "Which birds feast on cicadas?" One particularly enthusiastic friend practically shouted, "Kites!" 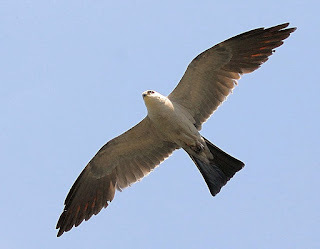 The smallish (14 inches from bill tip to end of tail feathers) Mississippi kite and his larger (22 inch long) swallow-tailed cousin survive on dragonflies and cicadas they capture midair. Only thing is, neither is an abundant visitor to New Jersey. They generally spend all their time south of the state, and though Mississippi kites have been making a very slow progression northward, it's still a big treat to find breeding pairs here. In any case, a handful of accidental visitors would be no match for the millions of cicadas emerging from their long slumber in the soils of New Jersey. We could only hope that word would get out on the kite network, and much as seafood enthusiasts head to shellfish festivals, these raptors would zoom up to the Garden State for a once-in-a-lifetime gustatory event. And, indeed, it didn't take long before an observant birder announced a sighting at Belleplain State Forest in Cape May County. Not just one Mississippi kite made it up here for the feast: as many as 15 at a time have been spotted roosting in a dead tree along Lake Nummy. Neither Ivan nor I had ever seen one in New Jersey, let alone more than a dozen, so we weren't going to let this opportunity pass us by. Belleplain is situated midway between the Atlantic and Delaware bayshores in upper Cape May County, in the lower range of the Pinelands. A fair amount of the 2000 acre property is designated for small campsites, and the kites were said to be visible from one of them in particular. We drove in, found a place to park at a trailhead near the side of the road and asked two passing hikers for quick directions to the campsite area. I was inclined to just head toward the most intense cicada hum, but Ivan preferred a more direct route. As an entry-level Pinelands experience, you couldn't ask for a nicer venue than Belleplain. Pitch pines dominate the woods, and the sandy level ground is cushioned with fallen and dried needles and leaves. Plenty in interpretive signs are posted along the hiking path, alerting strollers to the plants and natural features around them. We even found a bit of history near Lake Nummy, which had once been a cranberry bog owned by the Meisle family before the state acquired the land in 1928. During the late 1930s, members of the Civilian Conservation Corps had actually dug the lake by hand where the bog had been, creating a new recreational feature while also planting scores of pine trees to re-establish the forest. After a bit of unintended additional exploring, we found the (fortunately uninhabited) camping area and searched for the appropriate site from which to see the kites. Another birder was already at one of the lakefront sites, spotting scope poised. Hmm, I guess we found the right place. Indeed, we looked across the lake to the top of a tall dead tree and found a good dozen large birds visible to the naked eye. A quick glance through the binoculars confirmed it. Watching the congregated kites seemed almost a bit voyeuristic, as several were passing the time by preening and grooming. Others would lift off occasionally, presumably to nab a cicada in mid-flight. In general, they seemed pretty happy with where they were, no worries about having to seek out food. We were able to study them to our heart's content, a rare opportunity in our own state. So, I guess I have to give the cicadas credit: they brought us good luck with the kites. The luck for the cicadas, well, not as good. After my visit to the Old Yellow Meeting House, I took a look at my trusty DeLorme road atlas and the 1939 WPA Guide to New Jersey to figure out how to get myself to downtown Imlaystown. It wasn't as easy as it should have been. The atlas was helpful to some extent, but it lacked labels for some of the roads. As for the WPA Guide, well, let's just say that using it was akin to riding one of those big wheel/small wheel velocipede bicycles backwards, using a hand mirror as guidance. Reflecting the state of the road system in Depression-era New Jersey, the guide tends to reference routes by their respective surfaces: dirt, oiled or paved. This once-useful system leaves the present day traveler wondering whether the dirt and oiled roads are now paved or no longer exist. The book's Imlaystown route referenced a few of those. Consider that along with the fact that the stated directions were to the meeting house, not from, and you can see where things could get a little challenging without a navigator. Fortunately the guide offers very accurate mileage estimates, and I was in Imlaystown proper much more quickly than I'd expected. Had I been a bit more patient on my drive in from 195, I would have found it fairly easily before detouring for the Meeting House. True to the guidebook description, the community is densely built along the path of Doctor's Creek. It's said that the community superseded a former Indian settlement, and from the placement, I wouldn't doubt it. A series of small, old houses lines the road, packed closely together and seemingly near enough the street to make sidewalks unnecessary. Driving farther along, I found a broad intersection where the Upper Freehold borough hall and the Happy Apple Inn seem to be the major attractions. Make a turn toward Imlaystown Lake, and you'll find a picturesque pond full of lily pads, as well as a spillway that was once part of the adjacent Salters Mill and ice-harvesting operation. In a lot of ways, Imlaystown is much like any number of small villages dotting the more rural parts of New Jersey. If it hadn't been for the rolling landscape and condensed building pattern, I'd have thought I'd been transported to a town off the beaten track in Cumberland County. It's places like that which many out-of-staters would never believe exist in New Jersey. Spend a little time walking around, though, and you get the feeling that the place has seen better days. In fact, I didn't take any pictures of the closely-packed buildings because I didn't want to appear to be a morbid curiosity seeker. Most of the buildings are well over 100 years old, having replaced structures that burned down in the devastating fire of 1898. Preservation New Jersey listed Imlaystown on its Ten Most Endangered Historic Sites roster in 2004, citing its importance as a "mid-nineteenth century streetscape that appears to have been almost frozen in time." Despite a partial revitalization about 20 years ago, the community's buildings continue to deteriorate, partially due to issues related to their proximity to the creek. My research revealed some continuing efforts by local residents to drive further restoration, but it appears that the work is moving slowly, if at all. The area has been designated a historic district, and we can only hope that preservationists find a way to work out the issues blocking further action. A few weeks ago I got a message from Hidden New Jersey reader and renowned bird blogger Rick Wright, asking whether I'd ever written about Gilbert Imlay. No... I'd only heard the name Imlay in reference to Imlaystown, a section of Upper Freehold and the supposed home of Hannah Saltar and Mordecai Lincoln, the New Jersey ancestors of our sixteenth president. It got me curious, so I took a drive through the countryside of Monmouth County to find the tiny community. You'd never know it once you're there, but Imlaystown isn't far from I-195, and as the crow flies, it's practically next door to Six Flags Great Adventure. Rather than using the GPS, I was going slightly less high tech: directions jotted down from a Google Maps search. I hadn't looked up a specific address, so I was hoping it would get me to the center of town, such as it was. Thing was, I got distracted along the way. Sure, I got off 195 and rambled down country roads, but then I saw a sign for the Yellow Meeting House staring at me from the other side of a T intersection. 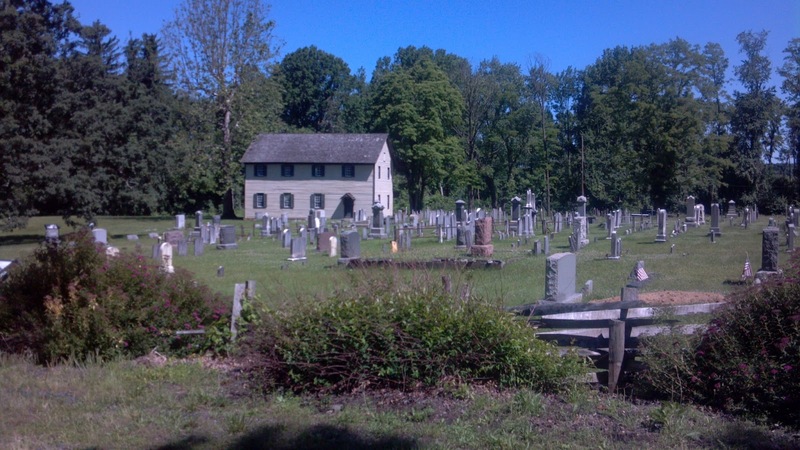 From my earlier reading, I knew this was the oldest house of worship in the area, having been built in 1737 on land donated by the Saltar family. There was nothing else of note within eyeshot, so I figured that if I found the Meeting House, I might find the town nearby. An arrow on the sign pointed left and said "Three miles," so I took note of the odometer and made the turn. A shade less than three miles later, I came to an intersection with Yellow Meeting House Road. Gotta take it, right? Regrettably, a fair number of widely-spaced McMansions had been built on either side of the road, followed by some older split-levels and ranch homes as I drove along. Could I even hope that the view of my destination was unspoiled, at least a little bit, by 20th and 21st century housing? Then, as advertised, I found the Yellow Meeting House, far back in a field dotted with gravestones, seemingly untouched by modern life. The WPA Guide to 1930s New Jersey notes that "a side door is kept unlatched so that anyone may try out the white box pews or climb to the large balcony in the rear." I didn't find this to be the case, but a glance through one of the many windows revealed a simple yet impressive interior. 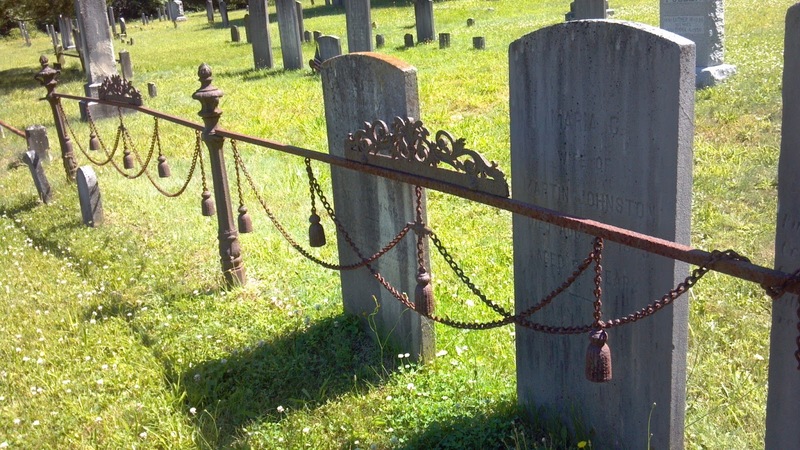 Jonathan Holmes died in service, Aug 4, 1777." Indeed, one of the church's early ministers was a strong advocate of American independence and may have influenced Holmes' decision to join the army. Reverend David Jones was ordained at the Yellow Meeting House in 1766 and continued preaching there until late 1775, when his sermon "Defensive War in a Just Cause Sinless" became a widely circulated message of patriotism. He soon took a chaplain's post with a Pennsylvania regiment and accompanied troops to Brandywine, Germantown, Valley Forge and Monmouth. Like Reverend James Caldwell, he became well known to the British, to the point where General Howe put a price on his head. 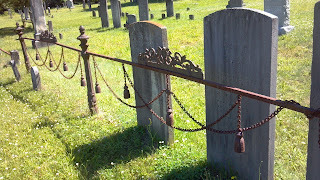 Perhaps it was Jones' spirit that drew a wary presence during my visit. As I walked from the graveyard toward a historical sign nearer the parsonage, I heard a hawk screech in the near distance. Looking up, I saw three red tailed hawks circling above, as if to warn me: show respect for our dead! I may have overstayed my welcome. It was time to make my way back to Imlaystown proper and find what I'd originally been looking for. That's a story for next time... and I'll eventually get to Gilbert Imlay! A secret corps of paratroopers from New Jersey were instrumental in the Allied victory on D-Day, during World War II. Their story was briefly included in the blockbuster 1962 movie The Longest Day, but no mention was made of their origin. I discovered this on a visit to the Aviation Hall of Fame in Teterboro, where one of the paratroopers is suspended from the ceiling below a parachute. He’s not human. He’s a rubber decoy. Developed by the Switlik Parachute Company, 500 para-dummies were attached to parachutes and dropped from airplanes behind enemy lines, intended to distract German troops from the actual dropzones where live paratroopers were landing. If the torrent of descending bogus parachutists wasn’t enough to cause confusion, they were accompanied by special forces personnel who deployed sound recordings of battle noises. The decoys also exploded with the sound of gunfire when they made contact with the ground. The irony is that the Allies fooled the Germans at their own game. In 1940, the Nazis had tossed straw-filled dummies out of airplanes over the Netherlands, Belgium and Scotland to incite fear in the population. It was the first recorded use of human decoys by an airborne military, setting off a small industry in developing more convincing paradummies. If you’ve seen The Longest Day, you might remember the highly lifelike (yet smaller) detail of the decoys said to have been used by the Allies. In reality, such detail likely was unnecessary and probably too costly, given the expendability of the dummies. As the war progressed, though, improvements made the decoys’ earthbound fall more convincing to observers from the ground. Museums in Europe hold a variety of WWII era dummies, including the American-made, British-deployed Ruperts (sack cloth filled with sand or straw), the American prototype Oscar (non-magnetic metal and, ironically, developed with the help of Douglas Fairbanks Jr.) and the PD Pack (rubber) developed by the Navy at Lakehurst. Though the Switlik dummies appear to have been Ruperts, the Aviation Hall of Fame displays what looks to be a PD Pack. Switlik is still in business, and has been manufacturing in Trenton for over 90 years. While the company stopped producing parachutes after the Vietnam War, the family-owned business continues to make life preservation products for the aviation and marine markets, including life rafts, life vests, and anti-g and anti-exposure suits. Just when you think you've heard about every Revolutionary War story about New Jersey, something else pops up. A while back I wrote about American troops camping beside the Rahway River in Cranford during the winter of 1779-80. While others were stationed at General Washington's winter headquarters in Morristown, General William Irvine's men were part of the forward defense against potential raids by the British troops stationed on Staten Island. The Redcoats would often come to New Jersey in attempts to steal food and supplies from the locals and had even tried to kidnap Washington. Morristown gets all the press, but soldiers stationed at the little-known cantonments in Cranford and other communities closer to Staten Island actually had a better time of it. Though everyone had to deal with the heavy snows and cold weather, it was far easier for commanders of the smaller groups to keep their troops fed and housed. In the midst of this hardship, Washington formulated a daring plan to attack General Wilhelm von Knyphausen's British troops on Staten Island. The narrow Arthur Kill was frozen, offering a rare solid surface for troops to cross from Elizabeth or Perth Amboy. Perhaps Washington was thinking that American forces would be able to reprise the surprise Trenton raid that had turned the tide of the war for the Americans in December 1776. General William Alexander (a.k.a. Lord Stirling) and Lieutenant Colonel Alexander Hamilton met at Crane's Mills on January 13 and 14, 1780 to finalize the tactical aspects of the plan to be executed the following day. Rather than using Durham boats as Washington's troops had in the Delaware crossing, the Americans would be able to use land-based transportation: sleighs. Yes, you read that right: sleighs. In what's been deemed one of the strangest military operations of the Revolution, Stirling and Hamilton mustered 500 sleighs to transport 2500 troops across the Arthur Kill. One would guess that the secrecy of the operation meant they didn't include jingle bells to the mix. There's a good reason why there's no famous painting of this crossing to pair with Emanuel Gottlieb Leutze's Washington Crossing the Delaware. Depending on which data source you consult (and there aren't many), the attack was cancelled either because the British had caught wind of it, or due to extreme cold weather. This, however, didn't stop Washington from ordering several smaller incursions on Staten Island throughout the winter months. Six months later, von Knyphausen would lead these British troops unsuccessfully in the Battles of Connecticut Farms and Springfield. You have to wonder whether those conflicts would have happened had the sleigh attack on Staten Island been executed successfully.